It is a typical situation when youth runners buy new spikes, use them a few times for racing during the season, and next year they grow out of them. So as a result, practically new shoes get laid off. We try to find them a new master and to extend their useful service. Please look at the currently available spikes below and see if you'd like to try them. All the shoes listed are in working condition. If you own spikes that you no longer need, consider donating those to the Club. Maybe someone will get them a new life. Note that proper training and conditioning are necessary for youth runners to run in spikes and benefit from them. Spikes are racing shoes, which have much less cushioning and less support than regular running shoes. 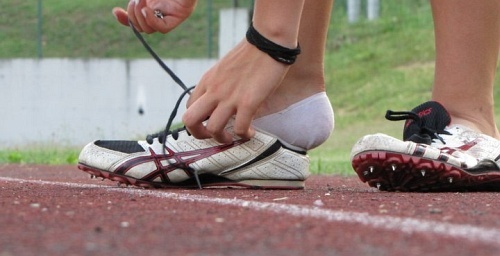 For racing in spikes, runner's feet should be strong enough to maintain proper form and racing speed. In general, spikes create more stress on lower leg muscles and tendons (especially calves, achilles tendon, fascia, and heel) than regular running shoes, and can provoke injury if runners are not ready for them. As a rule, we suggest that first year runners do not wear spikes and wait until they feel confident with their running and ready to raise bar in their races. If in doubt, please ask the coach. If you are interested in the any of the shoes listed here, please email to ntfxc.club@gmail.com. All the shoes are available to NTF Club runners for free.